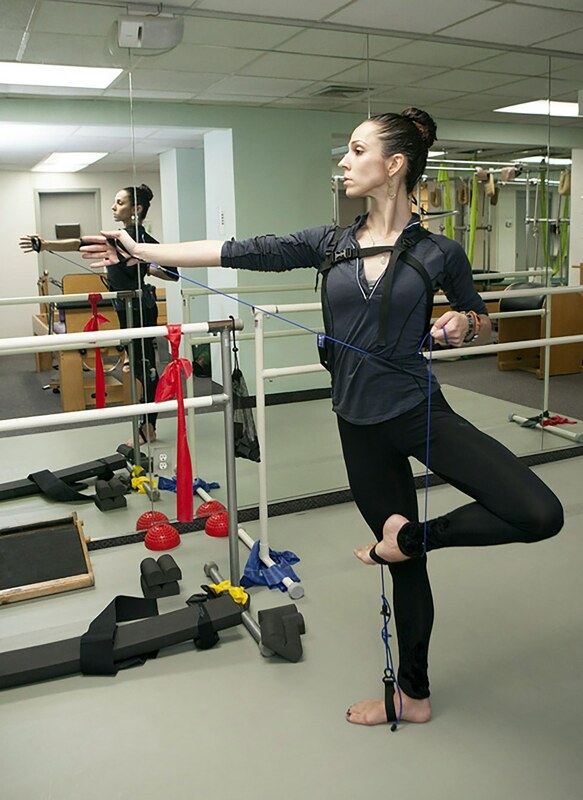 In her work as director of physical therapy for New York City Ballet, Marika Molnar relies on tools like bands, balls and Pilates equipment to rehabilitate and strengthen dancers. She says there's a place for such tools in daily dance classes, as well. Resistance and stability tools can help students develop strength and even break bad habits. "Say someone is compensating because of a weakness or restriction—that's what they're always going to do," she says, even after a teacher corrects them repeatedly. "If you give them something that makes things a little unfamiliar, their brain has to participate more. It becomes not only a physical exercise but a cognitive one." The dancer learns in a new way, and improves. Molnar has collaborated with Pilates expert Joan Breibart and PTs at Westside Dance Physical Therapy to create a series of tools and exercises with dancers' training and recovery needs in mind. Here, she shares three of her favorites. A common injury Molnar encounters, especially in ballet dancers, is dancer tendonitis from too much plantar flexion (pointing the feet). She uses the Mini, a squishy foam block with one flat side and one double convex side, for stability exercises to warm up and strengthen the intrinsic muscles of dancers' feet and ankles. "I wanted them to learn to stand on their foot without pushing down on their big toe unnecessarily," says Molnar, noting that this can stress the tendon that runs from the back of the calf and attaches at the big toe. "I developed this little Mini thing so they learn where their center really is in their foot. They can't push down because their big toe is not on the floor." 1. Start by standing on two Minis, flat side up, in a comfortable parallel position. The groove of the uneven side should run perpendicular to your feet. Place your first metatarsals at the edge of the foam, so your toes hang off and you can't use the big toe for balance. Think about centering your weight over your feet. Just standing like this with a soft bend in the knees is a subtle test of balance and proprioception, says Molnar, a step up in difficulty from balancing on one foot at a time. The intrinsic foot muscles will activate, as well as the muscles at the front of the shins (like the tibialis anterior) and the stirrup muscles that lift the arches (like the tibialis posterior and peroneus longus). After standing for two to three minutes, try 8 or 10 small pliés, keeping the ribs together and no sway in the lower back. Readjust the Minis to repeat in second position and a wide fourth on both sides. 2. Flip the blocks over so the flat side is down. Rest your metatarsals on the foam with your heels on the floor to stretch your calves. Try it both with knees bent and with them straight. 3. Stand with your heels on the foam and your toes relaxed on the floor, and try doming in this position for a super workout of the muscles that point the toes. How do you help a busy dancer recover between classes and rehearsals? Molnar developed the Parasetter to help dancers oxygenate their muscles and calm their nervous systems, with an emphasis on breathing into the back of the rib cage. It looks a bit like half a foam roller with two humps, so dancers can lie on it with their spine in the channel and their rib cage supported on either side, "so they could feel the ribs," Molnar says. "It's hard to explain how to breathe into your back ribs if you don't really feel it." There's a head support for spinal traction and head alignment, and a wrap that envelopes the rib cage, which Molnar says has a calming effect and shows dancers the correct rib position. She teaches an entire class with a series of relaxation poses and stretches on the prop. For example, a dancer could stretch her hip flexor by resting her supporting knee in the channel of the Parasetter and lunging forward on her opposite leg [pictured above]. 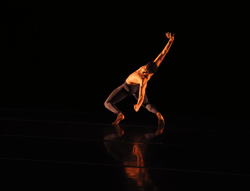 Molnar says dancers can also rest on it and breathe between classes, or at the end of a long day. The Tye4 connects four adjustable resistance bands—totaling 15 to 20 pounds of resistance in all—to bungees that offer resistance/assistance, based on how you use it. There is one band for the hands and one of the legs. Molnar says by attaching the straps to hands and feet, the tool provides the support and resistance a dancer needs to give herself an entire barre—without a barre. It can offer resistance or support of the legs and arms in all directions, something replicable with a long resistance band, but Molnar likes having it all in one tool. Marika Molnar was hired as New York City Ballet's first physical therapist in 1980. Today, she directs the physical therapy departments at NYCB and School of American Ballet, in addition to advising other programs and running her own practice in New York. She has acted as president of the International Association for Dance Medicine & Science and has been rehabilitation editor of the Journal of Dance Medicine & Science.